Let us know which products you would like in your kit. Frosty's Favorite - Rich butterscotch flavored coffee, a mouthwatering and sweet treat. White Wonderland - Sumptuous white chocolate mousse flavored coffee, a luscious and creamy indulgence. 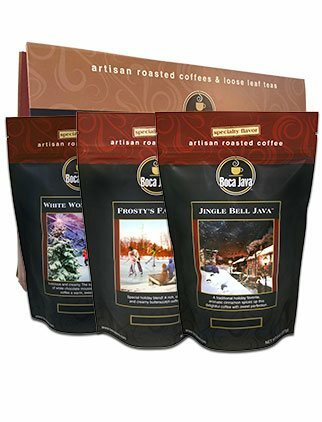 Jingle Bell Java - A classic holiday flavor of Viennese cinnamon that will fill your house with the scents of the season and bring you joy with every cup. These Holiday Flavored Coffees come ready to gift-and-give in a beautiful window box proudly showcasing the coffee treasures held within! Please note: Decaf coffee is 50 cents extra per bag.